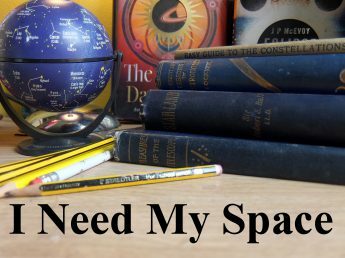 June | 2018 | I Need my Space! There’s a lot been happening lately with the Astronomical Society. I’ll write that up in a separate entry. It’s quite exciting. Last night I was able to go to Perton Library Astronomy Group. They’ve got an outside area where telescopes can be set up. It finishes at 9pm, so it didn’t get dark, but we were still able to get some good views of the Sun, Moon, and Venus. There’s always something quite serene about a daytime moon. It’s far less dramatic than the night-time Moon. Venus is showing about 60% lumination (is that the right word?) now. I’m finding I need glasses to fine-focus on the camera these days, and I forgot them last night, so I suspect I’d have gotten a better shot if I’d got them with me in Perton. But at least the gibbous Moon-like disc of our nearest neighbour can be made out. Back home, I set the 8″ scope up to get some images of Jupiter, which is relatively high at 11pm now. While I was waiting for it to appear from behind a tree, I saw Vega over the city, and as an experiment, tried to find the Ring Nebula. I was surprised to see it, and was even able to make out the familiar doughnut structure of the gas ‘bubble’. I wondered what difference a light polluting filter would make? The sky is so bad in Wolverhampton, that I could hardly see Albireo in Cygnus with the naked eye. What a shame. Nevertheless, with a high ISO and a half-second exposure I was able to image the stunning double, and the colours are apparent in the photograph, so I’m pleased. Beta Cygni is about 415 light-years (127 pc) away from the Sun. When viewed with the naked eye, Albireo appears to be a single star. However, in a telescope it resolves into a double star consisting of β Cygni A (amber, apparent magnitude 3.1), and β Cygni B (blue-green, apparent magnitude 5.1). Separated by 35 seconds of arc, the two components provide one of the best contrasting double stars in the sky due to their different colors. And lastly, Jupiter. The seeing was not very good last night, and the planet being above a block of flats too, made it a rather poor object for photography, and I’m still using the software like an idiot, but the red spot (looking disappointingly grey) was facing the Earth. This was 11pm last night. A minute if film steadied in Pipp, stacked with Autostakkert, and tweaked clumsily in Registrax. I’ve got a copy of Photoshop now, so I really should be capturing in RAW and doing proper tweaking.